Vikings rookie receiver Cordarrelle Patterson is wearing the No. 84 jersey that Randy Moss used to wear in Minnesota. Moss has a problem with that. Moss, now a commentator for FOX, said on this morning’s pregame show that he thinks it was disrespectful to give a player who hasn’t accomplished anything in the NFL yet the number that Moss had so much success wearing. Moss was smiling as he said that, so it’s possible that he was just trying to be funny, but he seemed to be genuinely disappointed that Patterson has his number. But his complaint is rather odd. For starters, what does Moss mean when he says he doesn’t believe in numbers? Does he think players should just wear plain jerseys without numbers on them? If so, why does he care who wears his number? Then there’s the question of why Moss thinks a rookie can’t be issued his number until that rookie has proven himself in the NFL. But every rookie has to be issued a number, and every number has been worn by a good player at some point. If Patterson can wear No. 84 only after he proves himself, what is he supposed to do until then? It’s also odd that Moss didn’t seem to have any problem with Michael Jenkins wearing No. 84 in Minnesota. What has Jenkins done to prove he deserves Moss’s number? Maybe Moss just thinks the Vikings should retire his number. Memo to Randy — it’s disrespectful to mime mooning the fans while wearing a Vikings uniform. Thats why Fox hired him, they want him to say things like that. Hey Randy, what’s 84 + 0 Super Bowl rings? The way that Moss handled himself when he returned to the Vikings was disrespectful. He has no place commenting on what respect is. Vikes fans will always look at 84 and see Moss, having him here was a thrill, lucky for us we have AP to enjoy now. He should at least run over one traffic cop before he gets 84. Apparrently, randy whines when he wants to whine. 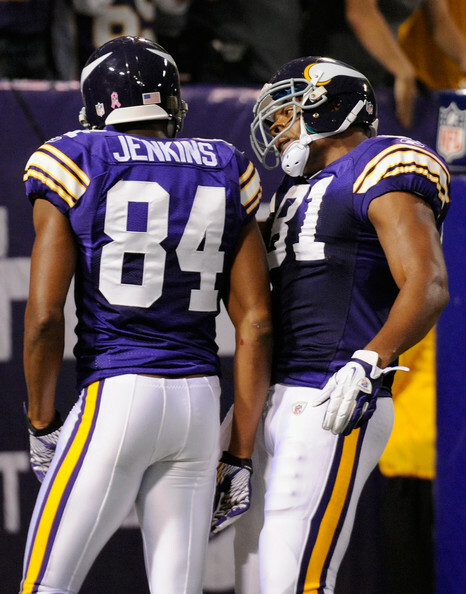 Jenkins was the best 84 on the field last year when the vikes beat the niners. Straight crap, homey. meh, he said it all with a smile but he is correct. I doubt the Vikes did it to intentionally be disrespectful but that number will always be Randy Moss. Here’s a lesson you should have learned as a child, respect is earned. Why do networks hire border line window licking short bus riding morons like Sapp and Moss anyways? Um, sorry Randy; we’re not going to retire your number. Good riddance. Randy, it was pretty disrespectful for you to dog it as often as you did during your career. Figured something like this would happen sooner or later. if Moss was not a head case he wouldn’t be talking about this! You lost me right there, chooch. Maybe Patterson can add some professionalism to number 84 in Minnesota, which was the one thing that was obviously lacking. Moss was not a commentator when Jenkins was in Minnesota. Yes, the Vikings should retire his number! 2nd GOAT(wr). Even in his 1st year of retirement (maybe), Moss still a prima donna. If you don’t believe in numbers, why are you crying about it? Once a diva, always a diva. Or in Moss’s case, superdiva. Obfuscating stupidity for the sake of filling space isn’t going to fool anybody, you got what he meant. If you watched it, he was obviously saying it in jest, like he was feigning hurt that the Vikings would do that. But he was smiling the whole time. What he really wants is for the Vikings to retire his number and put him in their ring of honor & this is his way of dropping that hint. I think that should happen, no matter what the media or some fans thought of him during his gloriously productive Vikings career. There’s only so many numbers to go around. Someone’s a little full of himself if he thinks no one else has the right to wear that number. Moss’s immaturity is apparently still there after all these years. As a Viking fan I never cared about randy moss’ opinion on anything and still don’t. Always been a tool. We’ve moved on randy. Randy Moss makes more sense when he is picking his nose for the camera. If it’s not retired then it goes into the hat like any other number. Maybe you shouldn’t have been such a jerk during your playing years ? 49ers never gave #80 to anyone after Rice… Just saying. Maybe Moss forgot how his second stint in Minnesota ended. Just being a great player isn’t enough to get your number retired, or not given to a rookie, or whatever nonsense Moss was whining about. I heard him on the pregame and to me it definitely sounded like he was serious about it. Moss doing exactly what Fox hired him to do. Does His Highness also think that a pro football commentator with the same name shows a similar lack of respect? He was obviously joking. That said, Moss is and always will be number 84. Because they say outrageous things and we’re giving them free publicity talking about what they say. Networks only care about ratings. I didn’t care about what he had to say when he played, I care even less now that Fox is paying him to be Skip Bayless. To everyone else who is posting as if he’s reading the comments, he’s not. your self righteousness is only giving him an audience. that part he is paying attention to because it is what is getting him paid. so your whole “HEY RANDY _____ followed by put downs” is just giving him money. It’s more of a nod to Randy than anything else. Take it was a compliment that they hope this young man can impact the team the way randy did. Every major network now has a village idiot for their pregame show. I can’t watch any of them any more. I’ll always love Randy Moss. I’m going to love Cordarrelle Patterson this year. Take that back Moss. That hurts. I have no further comment on this story. When does Moss think he will deserve the #84? Shut it Randy!! During Moss’ career, it would have been hard to find a less mature, less ‘respectful’ player than Randy Moss. Please shut up, Mr Moss, and just go away. He’s not the big about numbers, BUT. Shut up Randy. You ‘made’ 84. OK. I always enjoyed your contributions to the Minnesota Vikings. You might be in the Hall one day. Would you go in as a Viking? I’m not certain I’d like you to. Jim Kleinsasser ‘made’ 40, if you ask me. If you ask him, he’d disagree. I respect Jim Kleinsasser because he gave everything on every single play. He contributed absolutely every game for his entire career. Never left early/quit on his team. He could have thrown a Coke machine, but never pitched a fit. When I see 40, I see Ellison on the back, but I think of Kleinsasser. When I see 84, I hope Patterson breaks a long one. Patterson is at least the third receiver to wear 84 since Moss left (Allison and Molasses Mike). What about it is disrespectful? The fact that he may develop into the best receiver we have had other than Percy since Moss? The fact of the matter is that 84 isn’t a retired number yet. The only thing I can see as disrespectful is the last two scrubs that wore 84 besides Moss. CP chose 84 because Randy was the player he looked up to. He has always worn 84 and it’s because of Moss. It’s a tribute more than anything else. I wouldn’t expect someone like Primadonna Randy to understand that though. I think he is scared CP will become great and when 84 is finally retired, the back will read Patterson and not Moss. First the catering food wasn’t up to par, now this. What will make this guy happy? Wow Randy, the way you acted the second time you came around does not warrant the ring of fame. Your fame was broken with your act. Maybe you can make the ring of honor in Tennessee. Is this a joke? Patterson wore the number in college. He isnt’ the first player since Moss left to wear this number. Aundre Allison…shudders. Players aren’t “given” numbers. They pick an available one, or they bribe another player for the number they want. If it isn’t a retired number, it is available. Give Randy 666 and put him in the Dante’s Inferno ring of dishonor — love boat on the river styx!